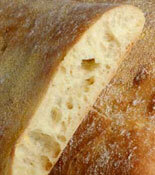 Italian style semolina bread coated with cornmeal dusting. 6″ by 22″ by 1.5″ high. Perfect for creative sandwich shapes.